Back on Track is endorsed by many of the top riders and trainers in many disciplines because the products are highly effective and work consistently. Our goal is to help keep horse's in top health and performance! Back on Track products gets dogs, horses, and people feeling healthier, and emanates from Sweden. Already popular in Europe, they are now getting rave reviews in the USA. Back on Track is endorsed by many of the top riders and trainers in many disciplines because the products are highly effective and work consistently. Our goal is to help horse owners, trainers and professionals keep themselves and their horse's as healthy as possible. Horses at all levels of performance/activity and at all stages of life can benefit from using the products. How Do I Know If My Horse Can Benefit From Back On Track Products? Back on Track products can be used on horses all ages whether are working hard every day or senior horses. Our products keep their muscles loose, supply, and comfortable. Back on Track Welltex material creates a gentle warmth which helps reduce inflammation, eliminating many of your horses aches and pains. You’ll be amazed at how much your horse’s performance improves after using Back on Track products! Note: A Velcro strip detaches and may be sewn into an existing blanket for the means of securing it to the horse or may be used with a surcingle. The Equine Head Cap covers both the atlas and the axis. It has closures around the ears for optimal adjustability. Laces on each side to fasten under the throat, with re-enforcement made on the exterior where the halter rests. Only $39 SML sizes. What Make Back On Track Products Different From The Competition? What sets Back on Track apart in the equine industry, is our unique, state-of-the-art Welltex fabric that is used in all our products. This revolutionary fabric is interwoven with a polyester thread infused with a fine ceramic powder. By reflecting warmth, in the form of FAR infrared rays, back into the body, they create a soothing thermal warmth that can help alleviate pain associated with inflamed muscles, ligaments, tendons and joints. It effectively warms up a horse prior to performing and can accelerate its recovery rate after strenuous exercise. Because the products can be used for prevention and treatment of stress related injuries, they are an important part of your horse's regular care regiment. Back on Track is extremely easy to use because there is no need to monitor your horse while using it. Your horse can safely wear Back on Track gear all the time. Order Your Back On Track Products Today! Do you want to help your horse not only feel better, but compete better? Then you need to order our products today! 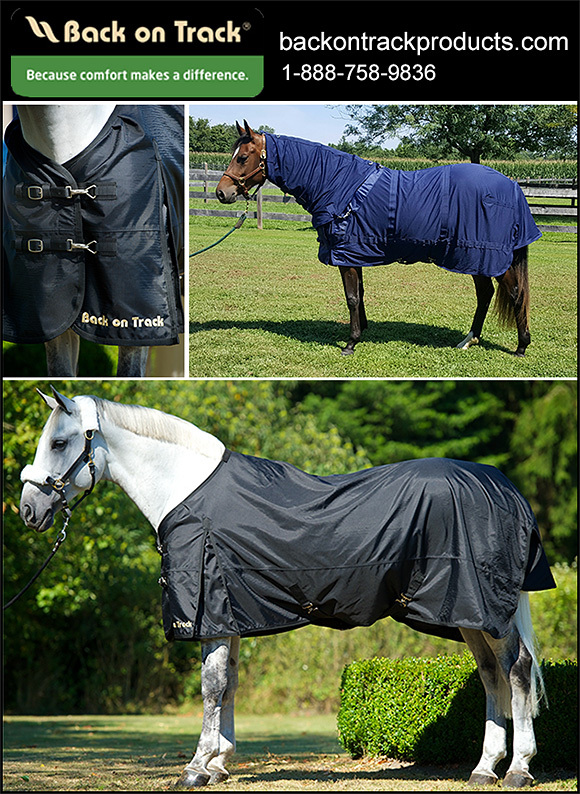 From our Blankets, Loin Blankets, Back Warmers and more, your horse can receive the soothing reflective warmth that both prevents injury and helps to heal existing problems. You can also find many Back On Track products at SmartPak, Big Dee's, State Line Tack, Dover Saddlery, and other fine catalogs and retailers. Call us to help you with any questions and order today!